The ten days or so we spent out there are ingrained in my memory in that way in which all the very best holidays are. I can still imagine the heat of the sun, smell skin sticky with sunscreen, the scent of barbecues on the beach and see the beautiful, bright colours of the coral, tropical fish and flowers. Underneath the more general memories of sight, sounds and smells are random, more specific moments – seeing a fresh coconut cracked open for the first time, snorkelling in t-shirts to protect our backs from burning in the sun, discovering a pufferfish bloated out like a balloon and seeing how many times we could somersault underwater in the ocean without coming up for breath. 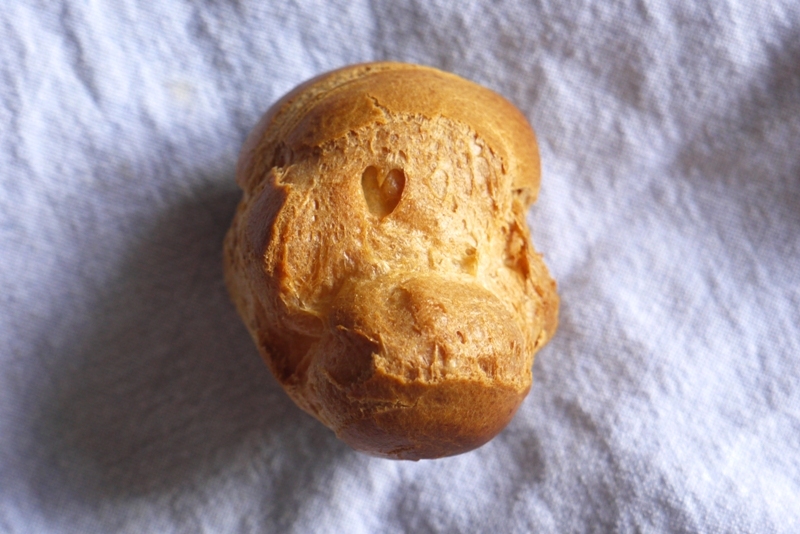 I love how this little heart shape appeared in the choux – baked with love! And then there was the coffee ice cream. I’m not a coffee drinker, but have always liked the flavour – even the age of eleven and especially when loaded with enough sugar and cream. The ice cream we ate on the veranda of our apartment set back from the sea was rich, dense and full of coffee flavour. It came in a tub bigger than anything I’d ever seen back in England (I imagine the American influence on the island), tasted totally delicious and is the coffee ice cream against which I’ll always compare other every other. Now’s the part where I’m supposed to describe how it came from an undiscovered artisan producer, hand-churning ice cream in their tiny local kitchen. Where I explain the proximity of growing bean to bowl of ice cream. And when I explain that I’ve always wanted to recreate this flavour at home as I’ve never been able to find it anywhere except on that one, far away island. Except that the ice cream in question was Haagen Dazs. Sometimes memories do that to us. The delicious wine we drank on holiday, the best burger we ever ate or our Mum’s homemade [insert childhood comfort food of choice] can sometimes be so wrapped up in sunshine and friendship and nostalgia that it’s completely impossible to separate the taste from the moment. I haven’t eaten Haagen Dazs coffee ice cream since that holiday. And I’m pretty sure that if I did, it might not taste as good. So instead I’ve made my own version, full of delicious ingredients, scooped into crispy choux pastry and drenched in hot chocolate caramel. It’s a little more hearty – a coffee ice cream for colder, more British climes – but no less delicious for it. Maybe one day I’ll go back to the Caribbean and the Haagen Dazs will taste amazing. Until then, I’m more than happy in my little London flat with a big bowl of this. Sticky, creamy, chocolaty & messy – exactly how a dessert should be! I’ve made the decision to move down to just one post a week for the foreseeable future. 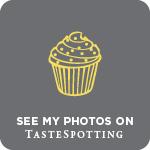 I want to be 100% happy with every recipe and photograph I post in this space with all the wedding planning and everything happening in 2013, I wouldn’t want the quality of each post to suffer. I’ll be back next week with a new recipe, see you then! In a medium sized saucepan, bring the milk, 250ml of double cream and coffee beans to the boil. Remove from the heat and set aside to steep for two hours (or longer if you want a stronger coffee flavour – I guess up to about five hours). In a medium bowl, whisk the egg yolks with the vanilla extract and salt until pale and thick. Put the remaining 250ml double cream in a separate bowl set over an ice bath. Strain the steeped coffee mixture into a small bowl using a metal sieve, pressing down on the coffee beans to extract every last little bit of liquid and flavour. Place the metal sieve over the bowl of cream then return the coffee liquid to your saucepan, add both sugars and bring back to the boil. Remove from the heat and pour into the egg yolks, whisking constantly. Return the whole mixture to the saucepan and cook over a medium low heat until thick enough to coat the bottom of your spatula, stirring constantly to prevent it from sticking. Strain your custard through the sieve into the cold cream and whisk until thoroughly combined. Chill the mixture overnight then churn according to your manufacturer’s instruction. Transfer into a container and freeze until needed. Preheat the oven to 200 degrees C. Line a baking tray with parchment paper. Place the butter, milk, water, salt and sugar in a large, heavy bottomed saucepan and bring quickly to the boil. As soon as it reaches boiling point and the butter is melted, add the flour, beating with a wooden spoon until a ball of dough forms that leaves the sides of the saucepan clean. Lower the heat and beat the mixture for 30 seconds to dry it out slightly then remove from the heat and set aside to cool for 3 minutes. Beat in the eggs, one at a time, mixing each thoroughly into the dough before adding the next. It may look a little lumpy at first – continue to beat and you’ll get a lovely smooth mixture. 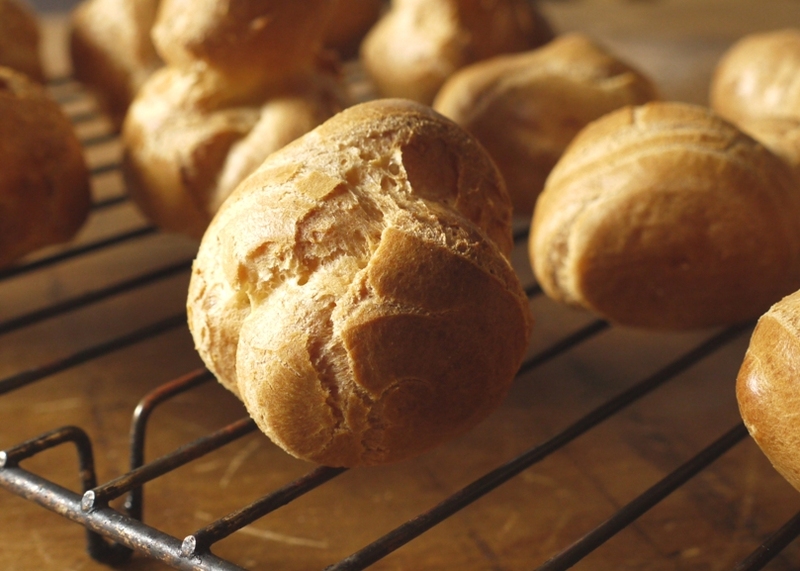 Transfer the choux paste into a piping bag fitted with a large plain nozzle and pipe large bun-shaped balls onto your baking parchment, making sure to leave a couple of inches between each one to allow them to expand as they bake. Bake for 20 minutes at 200 degrees C then turn the temperature down to 180 degrees C and bake for a further 10 – 15 minutes until crisp and golden. Remove from the oven, pierce a small hole in the bottom to let the steam out and leave to cool while you make your caramel. Spread the sugar evenly over the base of a heavy bottomed saucepan. Heat gently until the sugar begins to caramelize around the edges. As it does so, carefully pull the hot liquid sugar into the centre with a spatula and cook until your caramel is a beautiful dark amber colour. Remove from the heat and immediately stir in half the cream, being careful as it will fizz up. Whisk in the remaining cream and salt, followed by the chopped chocolate. You should have a lovely smooth caramel, but if any of the sugar seizes or hardens, return the pan to the heat for a few minutes until dissolved. Putting pictures like these online is just mean. Now that I’ve seen your profiteroles filled with perfect flavored ice cream and topped with fudgy sauce I will not be able to focus on anything else before I’ve had a couple of these. I’ve done the same with wine – it just doesn’t taste the same when you get it back home! All I want to do having read this is sit on a beach somewhere and eat a huge bowl of ice cream. Instead I’m stuck at my desk at work but thank you for transporting me for a few minutes. 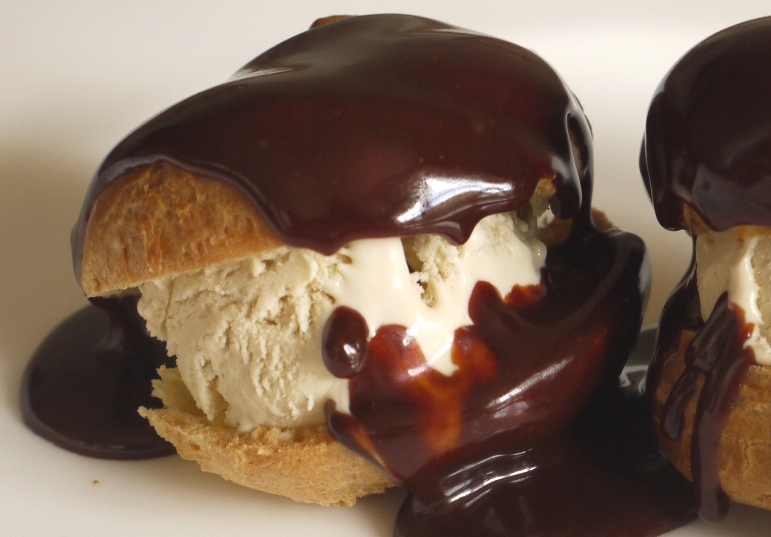 I love ice cream profiteroles (so much better than the cream stuffed ones) especially when they’re drizzled with a hot, sticky sauce. Delicious! Oh, a beach and a bowl of ice cream would be bliss right now! My Haagen Dazs memory is of pear sorbet in Cologne, Germany that even matched the texture of eating a pear. Haven’t had it since so I don’t know if it was the setting or the sorbet. Thank you for this caramel sauce–it looks delicious and I cannot wait to try it. Beautiful! I wish I had that as a dessert for tonight. I’m not a coffee drinker either–too bitter for me– but I do love coffee ice cream (esp. when chocolate is paired with it). Food on vacation always seems to taste different out of context/in everyday life. Don’t you hate that? 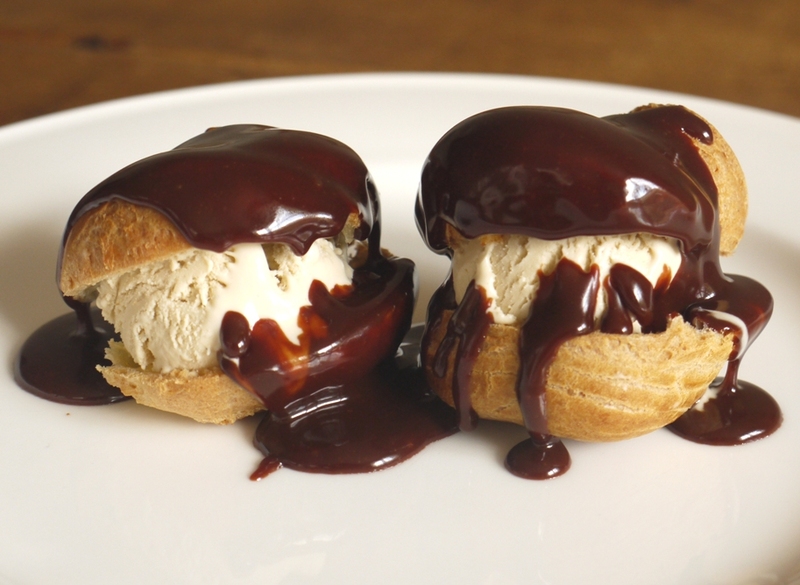 These profiteroles look fantastic… craving one right now! I’ve never made choux pastry, but I really want to give it a go. And I’ve never had profiteroles filled with icecream! Delicious. 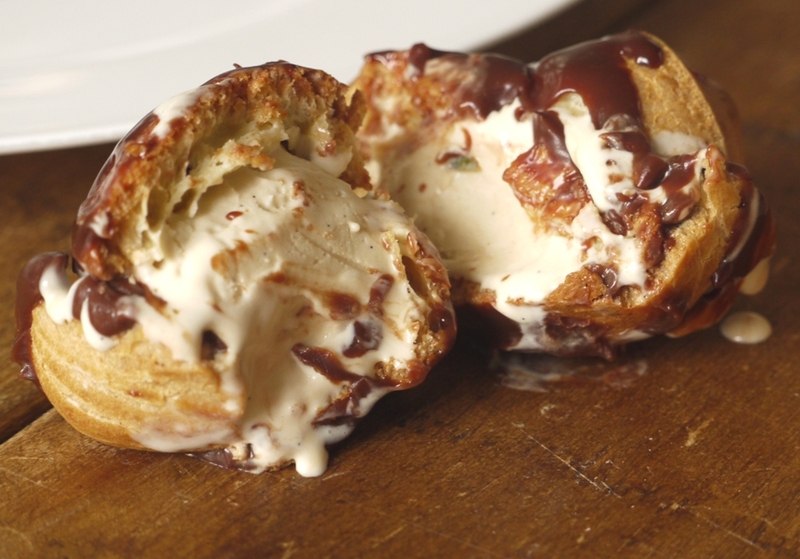 Profiteroles filled with ice cream – now this looks like a piece of heaven to me! I still haven’t tried making profiteroles. It’s another thing on my ever growing list of things to cook. But seeing these is definitely going to move them up a few spots! I know what you mean about food memories. When my husband and I went to Fiji we drank mojitos by the pool, and even though I know they weren’t the best mojito’s it was the combination of being by the pool, lazing in the sun with my husband and being on holiday that made them the best ever mojitos. You definitely should try them – they’re really easy and so delicious. Your trip to Fiji sounds absolutely wonderful – I can’t think of anything better! Please please please come to cake club and please bring this sauce! I had never thought of Choux and ice cream – oh me of little imagination. Looks like a winner and I love the heart, maybe its a sign! I’ve looked at dates and don’t think I’ll be able to make the next event, but hopefully sometime soon – it sounds brilliant! Great combination of flavours! I love making choux pastry, but mine never look as pretty as yours. I had my first taste of coffee, in the form of an iced coffee, while on a family holiday on Bribie Island (no where near as exotic as the Caribbean!). I think that is when my coffee habit/problem started (thanks Mum). Please take this as a cautionary tale – don’t give coffee in any form to a six year old! It’s great blog fodder but my mother reads it and I think she would be embarassed. Food will always taste better when there’s a good memory attached to it. I love how your story demonstrates that. And I love the look of these chocolate caramel-smothered profiteroles! Agh, wedding planning is a whole other job in itself, isn’t it? I have a friend who raved about a dessert she had at a local restaurant about a year ago: profiteroles with coffee ice cream and caramel sauce. Go figure. I’ve mindlessly craved this dish I never even ate myself for so long, and here it is! But with chocolate caramel. Which I love love love. Profiteroles filled with vanilla ice cream (though I do appreciate a good vanilla ice cream) bore me; I want them with coffee ice cream. Funny, because I’m not a coffee drinker either, but I love coffee ice cream. Oh, and Haagen Dazs? I know I’m all about making ice cream, but Haagen Dazs coffee is probably a little weaker than your homemade version but pretty darn good for store-bought :). I must have read her mind! And I think it’s totally possible to love coffee desserts without drinking it – in fact I’m the same with tea too. Looks yummy, liked the coffee ice cream. Thanks for sharing. I’m sure your homemade coffee ice cream is way better. Then put into a crisp profiterole and sauce…it had to be divine. I remember the first time I had Haagen Daaz…too expensive for my family…but we got some on a trip to Yosemite (its a mountain-and-waterfall filled park in CA)…it seemed so delicious! You’re so right about the vacations and food memories. The coffee ice cream sounds so good. I have not made profiteroles in a while. The ice cream filling is a lovely idea and hot-cold combination….yum! I adore the combination of hot and cold in desserts – so good! And find ice cream stands up to the sauce better than cream. That top photo is absolutely perfect – well done. Oh wow yum, these look so good! These look incredible! I can’t wait to try them myself. Chocolate caramel???!!!! Yes please! How did I miss this when I read this post first time? Destiny has led me back to it! It is written in the stars that I must make it soon! I love chocolate and caramel and the combination sounds incredible. I wish I could bite into this right now! That looks irresistible. I feel hungry just by looking at the photos.